New York: Harper & Row, 1970. This is a hardcover edition with a full color dust jacket designed by Mozelle Thompson. 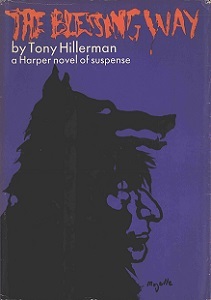 The back of the dust jacket includes a large black and white photograph of Tony Hillerman by Bob Lawrence and a short biographical sketch. Originally published as part of the Joan Kahn-Harper Novel of Suspense Series. Format: Hardcover, 21.5 x 13.8 cm. Binding: Violet cover boards and spine, title printed in red on spine.